Richmond Practice Consultants are trained specialists in ultrasound. 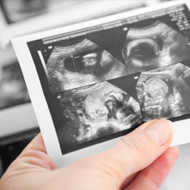 They are able to perform ultrasound scans as part of a consultation and explain the results. We also offer ultrasound appointments only at +richmond practice in London. Patients are referred by their GP for radiology appointments (ultrasound request form) and/or may self-refer if they require an ultrasound scan. The referring doctor will receive a comprehensive report of the scan. - To detect an ectopic pregnancy that places the mother’s life at risk. Baby scans to 20 week gestation is only done in low-risk pregnancies. - To assess the breasts for cysts. - To investigate worrying lumps: perhaps of the neck or thyroid; other swollen lymph glands; testicular lumps; abdominal masses/tumours. Properly performed, ultrasound scanning poses no known risks to the patient and does not use radiation. It has become one of the most widely used diagnostic tools in modern medicine. We use our ultrasound scanner on the same day as your appointment to investigate medical conditions and to respond to urgent concerns. We also integrate it into our health checks. Please call for more information or to arrange an appointment. Insurance: BUPA International and BUPA (UK), Cigna and most German and French international insurances. Aviva, Standard Life and Pru-health also cover our fees.